There's something for everyone as the one mile sparkling path winds its way through the world-famous gardens in a magical after dark experience. 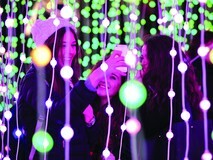 Now in its sixth year, our 2018 winter trail is bigger than ever before, with over a million twinkling pea-lights and thousands of laser beams. Walk under welcoming arches into a world festooned with seasonal cheer and wander beneath unique tree canopies drenched in Christmas colour. New this year, glittering spiral trees dripping with silvery shards guide you on your way. Enter the moonlit woods and step into a Laser Garden where refracting lines of light playfully bounce across the branches. Then stroll towards the Lake and pause at the waterside reflections made by a festive flotilla of hundreds of glowing boats gently bobbing on the shimmering surface. And for the finale, criss-crossing laser beams leap to life at the Palm House, with jumping jets of light and kaleidoscopic projections. Complete your trail with tempting treats under the stars – a spiced cider, mulled wine or hot chocolate whilst the aroma of roasting chestnuts and toasted marshmallows fills the air, then browse Kew's well-stocked shop for that extra special gift. 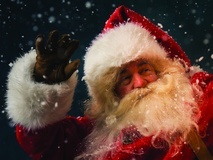 For the young ones, don't miss the Victorian carousel*, helter skelter* and other family rides* at White Peaks and look out for Santa and his elves along the way. New for 2018 - Christmas dinner at Kew’s Botanical restaurant. Two sittings are available, with dinner before or after your visit to the trail. Choose dinner at 5pm, in conjunction with a 7pm ticket to visit to the trail, or visit the trail first at 6pm, followed by dinner at 8pm. Must be pre-purchased in conjunction with your trail ticket, with entry at Victoria Gate. Main Entrance - Victoria Gate: Choose from nine entry times every 20 minutes between 5pm and 7.40pm. Last entry at the main entrance, Victoria Gate is at 8.00pm. Tickets with pre-paid parking at Brentford Gate - choose from eight timed entry slots, at 20-minute intervals, between 5pm and 7.20pm. Last entry at 7.40pm. 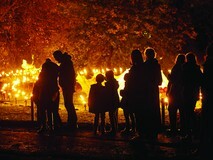 Advance tickets from £16.50 (£10 for children). Friends of Kew receive further discounts. Booking fees apply. *separate charges apply for the vintage rides.